Jo Peden is an experienced Iyengar teacher who teaches yoga classes in both a Wellington city-based studio and Island Bay. Her company is called Embrace Yoga. 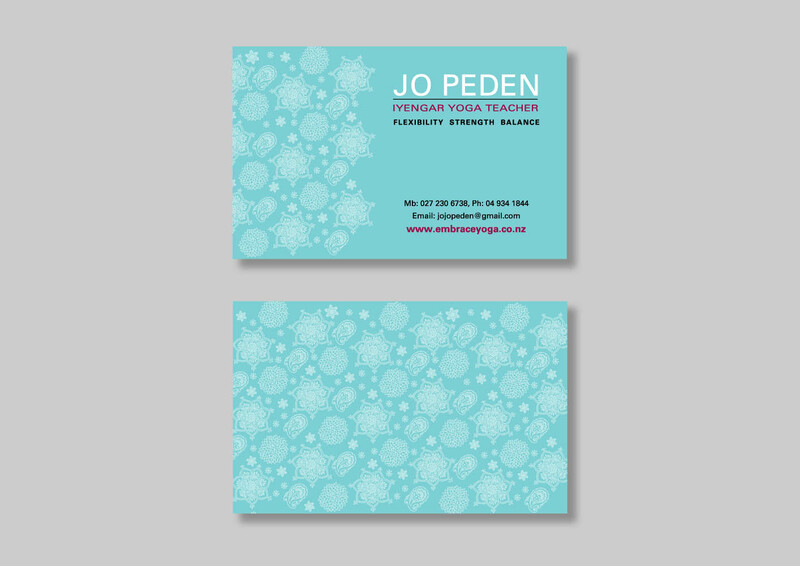 Jo required a company brand, business stationery (business cards and letterhead) and a website to be designed. Brief: To design a Brand, Business Cards and Letterhead. Solution: The brand is simple it is designed with a simple san serif font with the contrasting modern colours dark magenta and teal. The card design is simple with a beautiful paisley and peony flower line art textured teal blue background used for both the front and back of the card. Brief: A five-page profile style website containing a timetable. The layout needed to be simple and clean cut, easy to navigate and responsive so it looked good on all devices. based on a responsive template. Embraces brand colours and fonts were used along with professional photography.